When you create a book, thesis or a large document you need how to create an index easily in MS Word. This indexing displays at the end of the document in MS Word. It shows marked index entries along with its position in the active document in an alphabetical order. 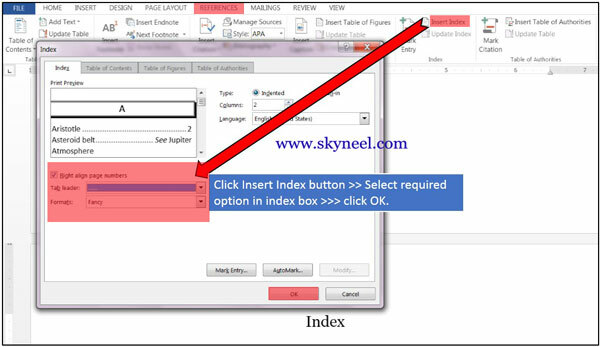 If you want to creating Index or Mark An Index Entry in MS Word, the first work is to mark the words which you want to include in the index entry. 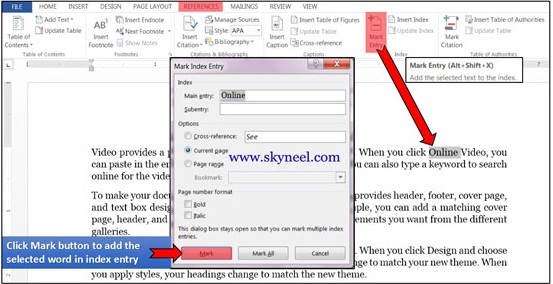 Step 1: You have to open an existing or create a new document in which you want to mark some words for index entry. Step 2: After selecting the one by one word you have to click Mark Entry button in the References Tab or you can also press Alt + Shift + X shortcut key combination to open the Mark Index Entry dialog box. Step 3: Click Mark Button >>> Now Click on the close button to add selected work in the mark index entry. Step 4: Repeat the previous step number 2 and 3 for adding another words in the index entry. 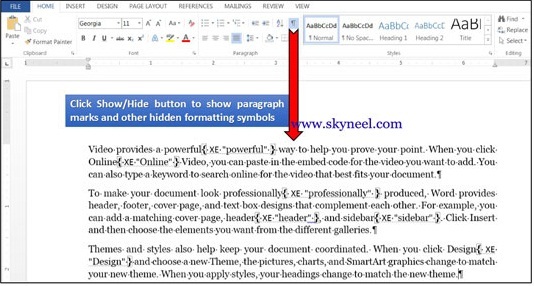 Step 5: After adding all words in index entries, Click show or hide button in the Home tab or you can also press Ctrl + Shift + * shortcut key combination (To hide all non-printing characters). Step 6: Take the cursor at the end of the document, then press Ctrl + Enter for insert page break, (or) Click Insert tab >> Page Break (or) Page Layout Tab >>> Page. Take cursor on last page where you want to show all index entries. Step 7: Now click Reference standard tab >>> Click on the Insert Index button >>> Select any required formats, Tab leaders and activate Right Align Page Number which you want to use >>> Now, click OK button. Step 8: Finally it shows the following final result. 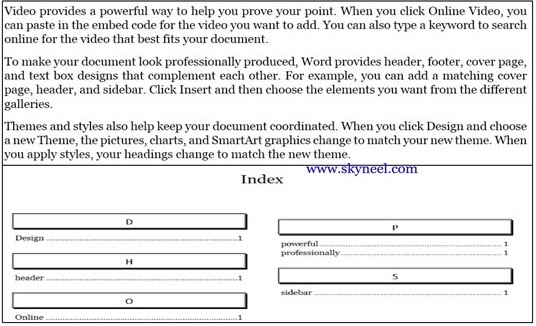 I hope you like this Creating Index or Mark An Index Entry in MS Word guide from which you will be able to easily Creating Index or Mark An Index Entry in MS Word without any extra efforts. If feel any problem in this guide then please use comment box. Thanks to all.